The super-efficient toothbrush by Chicco comes with a small rounded head, perfect for your child's mouth. 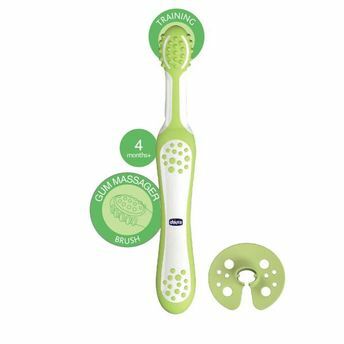 Comprising of massaging soft pads in extra-soft rubber, this toothbrush is ideal for a delicate action on enamel and to sooth sore gums. The large ergonomic hand grip allows for easy grip. Has a protective shield to prevent over-insertion of toothbrush.